Customers are evolving. They are evolving in the way they get information about products, what goes into making their purchase decision and ultimately how they buy. 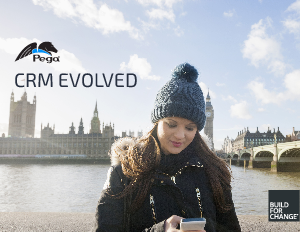 Businesses need to evolve and adapt how they manage their customer relationships. Customer Relationship Management (CRM) software was supposed to improve front-end customer engagement across marketing, sales and service. Unfortunately, most systems have the opposite result. Companies spend too much time integrating and maintaining disconnected systems and too little time nurturing relationships. Organizations need to transform their organizations from the inside out—embracing new processes and technologies that gathers, stores and gives them access to customer data so they gain more insight into their customers and therefore create more effective marketing and service programs. Download this Ebook and gain a better understanding of how a more robust CRM system can improve customer management.